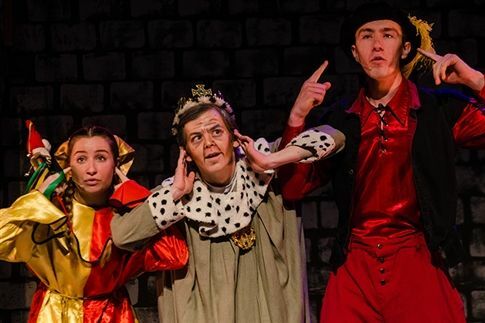 Backstage at Severn School’s Price Auditorium on Friday, there was a buzz of excitement as five of the principals from Water Street Players’ "Once Upon a Mattress" rendezvoused to share the news the performance was sold out. Perhaps because junior Jake Leroux stood in the shadows, the dark lines of the theatrical make-up he wore as King Sextimus appeared to have aged him from 16 to 68. Beside him, junior Matthew Beagan was positively dewy-eyed as the young Prince Dauntless. Idly strumming a lute as he approached the pair, senior Will McCollum clearly relished his role of wandering minstrel. In costume, but not yet made-up for her title role as Princess Winifred, junior Maddie Hawkins was breathless as she arrived with senior Mallory Gersh who was playing the devious Queen Aggravain. The elaborate gown and headdress worn by Mallory, as a Renaissance queen, was not only typical of the era but also emphasized her character’s unrelenting vanity. She commented on the fun of wearing it and of recreating the Tony Award-winning musical that has appeared on stage, screen and television with several famous casts — a show based on the story “The Princess and the Pea” that’s set in medieval times. For Jake, playing the role of King Sextimus who is “mute” throughout the play, was quite a challenge. “Having to express myself through pantomime, by moving my body rather than through dialogue, was an extraordinary experience,” he said. Matthew admitted the combination of comedy, costumes and music reminded him of being a kid again while Will found applying his considerable vocal and instrumental talents while acting as the musical’s narrator was fulfilling. Maddie enjoyed having a chance to spread her comedic wings. With 20 minutes to spare before show time, the scene in the McCleary Gallery beyond the auditorium was noisy and colorful. Set against the backdrop of an Alumni Art Show called “Art with Heart,” ticket holders sampled a buffet of desserts while viewing varied works from 35 professional and amateur Severn alumni artists. A line was forming by the doors but many casual conversational groups were gathered throughout the gallery. Tech crew parent Kara DeCicco chatted with Steve Cargin who noted, “Once Upon a Mattress” was the fifth Water Street Players production he’d seen. “There are a good many cast members who are seniors for whom this is the last shot. So it will be a lot of fun to see them,” Lauren said. Once the doors opened, the lines moved quickly and, soon, there was not an empty seat in the house. The theater darkened and the overture sounded from the orchestra pit. Minstrel Will stepped into the spotlight strumming his lute while describing, in words and song, the scene unfolding behind him in shadowy profile as one of 13 princesses auditioned before the royal court for the privilege of marrying Prince Dauntless. As the lights came up, one of the 13 princesses was being grilled by the Wizard with a series of trick questions that guaranteed she’d fail the test. As each princess failed, it was revealed no one in the kingdom would be allowed to marry until Prince Dauntless found a bride. After a panicked search for a princess who could pass the test, an unlikely candidate appeared in the form of Princess Winifred who showed up disheveled, having swum across the moat. Enter Maddie whose comedic timing was evident from the moment she stepped onstage. The Water Street players encourage the dynamic growth and deepened involvement of emerging, young artists. With a renaissance spirit and through quality programming, we strive to entertain, engage and challenge audiences through the art of theatre. 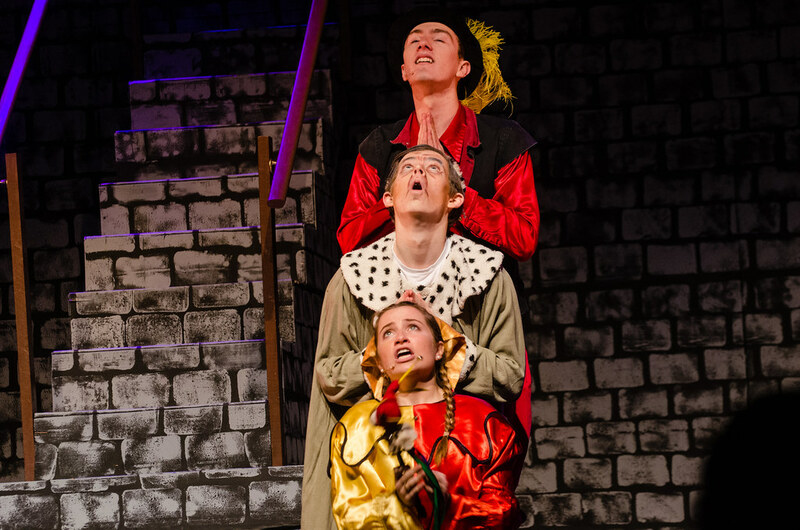 The Water Street Players present "Once Upon a Mattress."